To get started, long and wide advertised as "unique online concept" that will make much different from before, the multiplayer component of Bloodborne will now be surprisingly similar to the multiplayer features of Dark and Demon's Souls. The necessary items for connecting with other players like itself did not change, but the actual basic structure - cooperative game with summon of friendly companions, as well as PvP conflicts through attacks on the worlds of other players - still have stock. In this FAQ we present the individual components of the multi-player mode before again separately and explain their respective principles. In order to join forces with other players and to be able to connect, you are dependent on the two items Challenge bell and Small echoing bell. 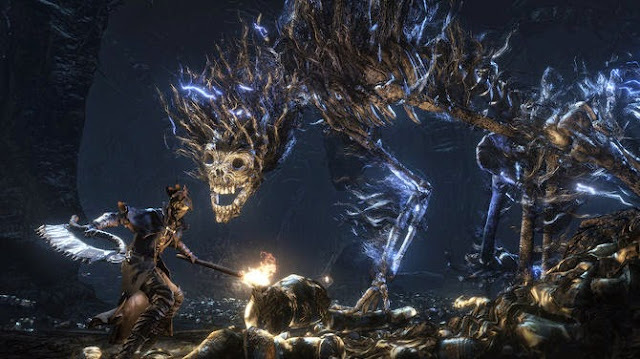 A total of up to three hunters can connect through their combined use on the part of the host and the guests acceding to make common hunting the monsters of Yharnam. The challenge bell you get quite early in the game - you have to enter the boss area of the clergy Beast and thus receive a counter to inspect the first time, in addition to the fresh lively breastfeeding doll a new group of messengers who give you the bell appears. Until you can win the Little echoing bell for you, passe some time - buy for a counter from the upper insight messenger that appears in the dream of the hunter, when you have gathered ten insight. Function does the whole thing in detail so: I want to request a player who support enable the challenge bell and an effect at his feet makes it clear that in the background after appearance is wanted. On the other hand, at the same time, interested players must turn the little bell echoing use to offer themselves as helping hands. If a matching pair found sound for both actors their bells and supportive player is in flesh and blood - not as well known as a simple phantom - conjured into the world of the host. The co-op community resolves itself automatically when you have together defeated the boss of the area or the host or the guest die. The third way to end the game is to fire the muffler, which can be found along with the challenge bell, which means that the guest player automatically returns to his own world. Also new is the ability to set a password for the session, which makes it much easier to connect with selected friends without having to resort to various rings as still in Dark Souls 2. For disputes against other players a distinct bell is responsible the Dark echoing bell. With this one can invade other hunters on their journey through Yharnam and compete in duels to the death against each other. Overall, it PvP focused players but a trace harder for other counterparty to enter into play than in Dark Souls, because PvP only in areas are now possible, where a so-called bell-Maid is present. The Sinister echoing bell can be just like the little bell echoing arise from insight messenger in a dream of the hunter. He appears as soon as it is the first time you collect ten or more insight. In order to enter into play other people, it is first of all necessary to bring the Dark echoing bell to sound again. In the background, the game will now start to search for raiding players. There can be only player attack in his world is just the bell Maiden present - there are several ways in which it can occur. In certain selected areas such as Chalice Dungeons the woman is locate by default, which thus serve as a focus on selected PvP areas. Even when your own ringing of the Dark echoing bell appeared the woman on her own play and makes it possible to be attacked even while you are on the search for possible victims. We also invoked the acclaimed woman when a co-op community comes about why it happens quite often that one encounters a counterparty who can draw on a little back cover. If a player only once penetrated into the game another player must leave his life one of the two combatants before the pairing dissolves. By firing the muffler, it is the host, so the invader, also possible to arbitrarily return to his own game, the chances of victory should be for example bad. Just as in the spiritual predecessors of bloodborne are co-op or PvP games are not the only two ways to associate with other players. Again, it is possible with a little luck to see at the same time playing hunter as shadowy phantoms flitting through his own game world where they can reveal a one or two hidden passage in favorable situations. When a player dies he leaves again back a silent witness of his death, only that this witness no pool of blood, but a grave stone this time. By pressing a button so you can jerk view the last moments of fallen warriors. Last, once again given the opportunity to create useful words and phrases to other players leave using the personal notebook in the game world, where they are brought in the form of recurrent messenger creatures to other hunters. These can also be found in bloodborne again assessed as helpful or wrongly, to show inexperienced stretching, which Note is really helpful and which only a nasty joke. For the first time you can leave you next to a text message in a visual form of a gesture in order to present your concerns still accessible beyond.